These flowers were fully closed when they were bought. The balcony plant was much smaller a few months ago and it is showing signs of the end of its life. Mostly cruelly, they have both gone down the rubbish chute because we are away on holidays to Perth and both would be dead by the time we return. There was still some food in the fridge, so my breakfast/brunch was cereal with half a banana, 1/3 of a tub of youghurt, 1/2 an avocado and a chew on the last of roast lamb still on the bone. 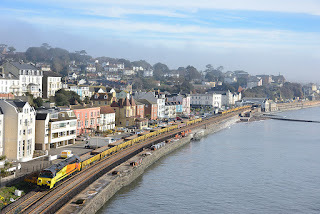 Blogger DeeJohn almost annually takes his holidays in Cornwall and I believe travels there by train. I have seen some of his photos and it looks to be a very nice train trip. 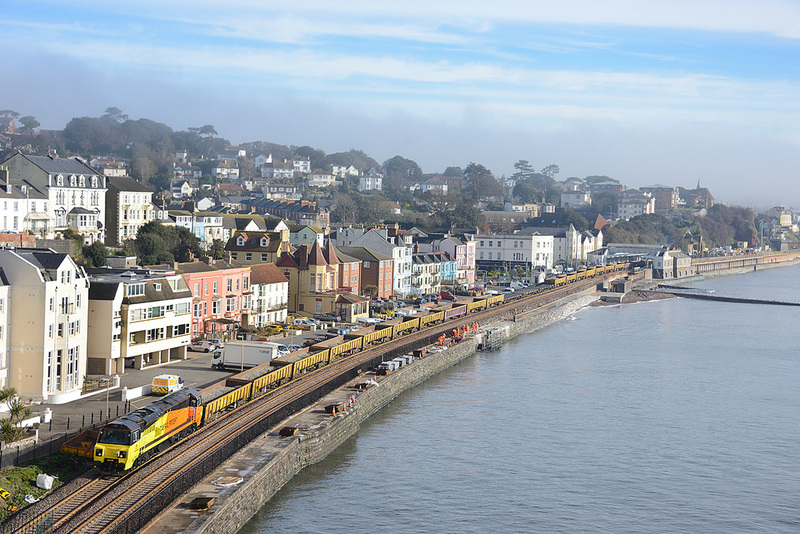 The relative warmth and weather of Cornwall attracts many holiday makers, along with its history too. I wold love to travel there by train from London on the Great Western Railway (GWR is not clearly defined. 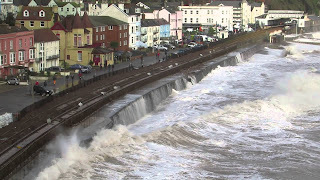 I would say Great South Western Railway). It was disappointing to recently hear the train can often be overloaded and that even with a seat reservation, someone may sit there and there is not much you can do about it. I don't think Victoria's own VLine conductors would allow such nonsense. 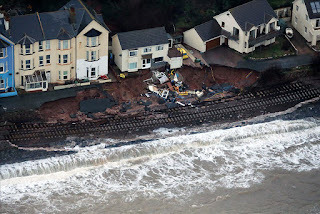 In a terrible storm in February 2014, the line to Cornwall was damaged where it passes along a sea wall in the small town of Dawlish, Devon. 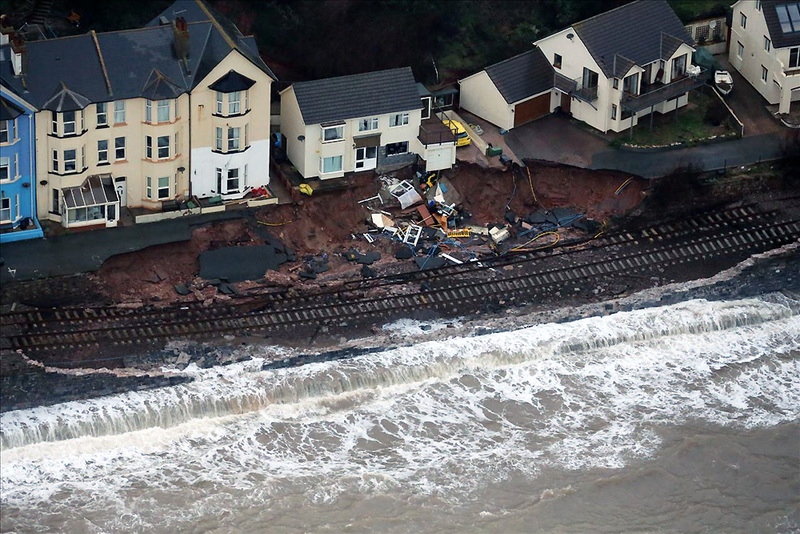 The sea wall was badly damaged and the train line left suspended in the air. 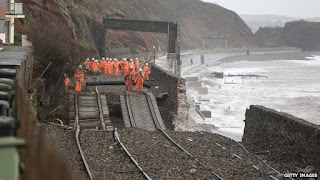 It took until April for the line to be repaired with repairs seeming to be underway overnight as well. Some interesting flood lights rising from ground at night and the retracting back during the day were used. Most photos are from English media publications. 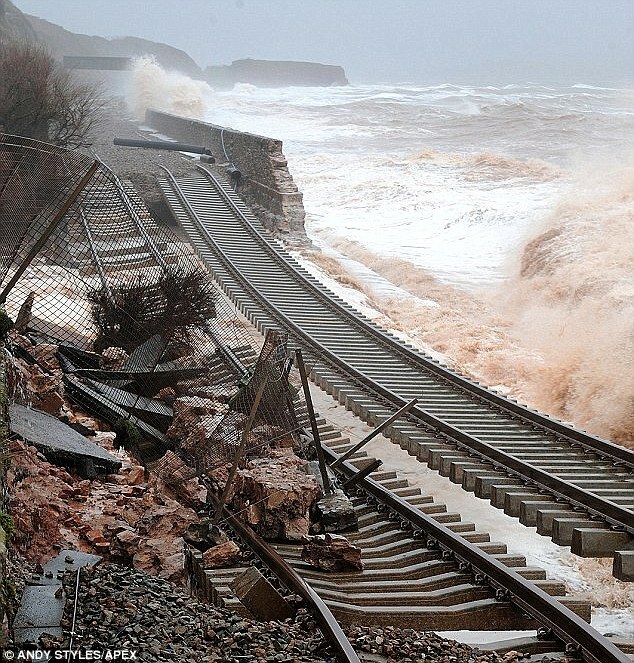 How pretty it must be to see the sea from the train window as you are off on your summer holidays. Big waves. Photo by Stewart Armstrong. 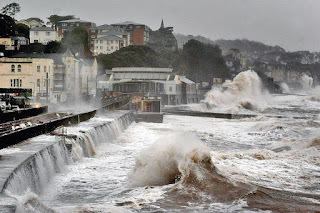 Great Britain does really big waves crashing into its coastline very well. Remember the photo I posted of a Blackpool tram with sea water swirling around its wheels as waves crashed over the sea wall, which by the way have been since improved. The track welding must have been very good. "You walk across." "No, you walk across first." "Where's the apprentice?" What a disaster. Peoples, be careful when stepping out your front door. I may be gay but generally I am not a gay activist. I feel somewhat more strongly about religious groups, not just lobbying, but pressuring politicians and companies. It is within the right of the Catholic church and our democratic system to do so, but we will judge such institutions by what they do. Telstra is one of hundreds of Australian companies to pledge support for marriage equality through AME's campaign. Its logo featured in full page newspaper advertisements published last year. At the time, many of those corporations were contacted by the Catholic Archdiocese of Sydney, which urged them to reconsider their public support. There was a justifiable backlash against Telstra. Telstra walks on a thin edge with me, as the NBN company who has set up in our building is hunting for customers. Telstra not being pro gay might just tip me over the edge. I'm participating in Musical Monday and I am sure River will her MM up first thing Monday morning. I was watching what was supposed to be an amusing You Tube clip when I realised I knew the background music, used to comedic effect. (almost anything can be made funny with music, especially But I could not quite place the music. I used Shazam to identify the terrific piece of music used on the clip of the very long Canadian train going through the spiral tunnels. Shazam worked out the name and artist of the track instantly. This piece of music took Shazam a little longer, but amazingly it gave me the correct result, 'written for the tv show Blott on the Landscape'. Of course, and what a brilliant show it was. R tells me it was shown here in the eighties. I thought nineties. How to describe it? George Cole (Arthur Daley) from Minder played the husband who lived with his wife at her family estate, that she was prepared to fiercely protect from a motorway ploughing its way through. The wife was played by Geraldine James who I remember from Jewel in Crown. The gardener of estate, Blott, was German and was also fiercely protective of his newly found English heritage home and country, played by David Suchet, yes later Poirot. Julia McKenzie played Cole's mistress, also well known then and later went on to more than adequately replace Geraldine McEwan as Miss Marple. I remember her from the tv show French Fields, from where we still at times use the line of her too close neighbour, It's only Sonia, as the neighbour Sonia entered the house without knocking. I suppose it was a comedy drama and it was really a terrific show, with Blott and his mistress up against her philandering and pro motorway conspiring husband. Here is the theme music and it seems the whole show can be watched on You Tube, but as much I loved it, I won't be....well, I don't think I will. I just don't have the time. Later note: This note at the You Tube clip is interesting. It obscurely makes reference to David Suchet but also the brass instruments are not. Before Poirot, there was THIS. By the way, the brass instruments on this are in fact all one multi-tracked human VOICE. Check out River's Sunday Selections too. Grace is busy with her A real mix of photos this week. Check out River's Sunday Selections too. granddaughter in Sydney and won't see this mural I came across. It is ok, but nothing special really. No large plane deaths in Australia, so I guess she survived the flight. This is not intact Victorian era housing, but shops that are part of Victoria Market. Taken through the window of a bus. I love the little mural at the main entrance to Victoria Market, even if no one ever uses the main entrance. With a minimum of R's tuteledge, Little Jo made these boiled eggs into gifts for each person at Easter. Some were hand painted, some stenciled and some shrink wrapped in boiling water. We went to Victoria Market for a reason. I just can't recall what it was. I left $100 poorer, but I did not buy a doughnut. I did buy a hat, one third of the $100. At the western end of the market you can buy a Spanish doughnut and the Spanish doughnut vendor has been there for a very long time and there was a long queue. Isn't this great. I saw a book I wanted to read, but I did not take it as I had nothing to put back. Fen is not inclined to get up early on a Sunday morning to capture the same sunrise from her flat that I too see from here, so here is what you missed last Sunday, Fen. Fen probably would not have seen the dots. Liquorice Man has a new friend, relocated from the kitchen wine shelf that is no more. Bit of a downer to end with, but it must have been about six months ago I noticed a group of people assembled across the road. I idly wondered why, but then I had blog comments to deal with and posts to write and forgot about it. Upon a walk we came across what they probably did back in October, one year after a high achieving, part aboriginal and a bit drunk lad was murdered. Hard to read. Text below. In our hearts you will always be there. Later edit: Well that is an interesting opening paragraph. I will leave it as is.